Review: Nagi’s crisp and soothing voice beckons me forward, luring me into a most wonderful trap. In composing “Kimi no Shiranai Monogatari,” Ryo seems to know my musical weaknesses all too well, and once the piano began to play, I was completely enthralled. Prior to watching Bakemonogatari, my only exposure to supercell had been through “Black Rock Shooter,” a song that I thought was merely okay (and I’m sure I’m in the minority on this). “Love and War” was better; I liked it well enough but beyond that, I wasn’t about to go out of my way to check out more of their music. Nagi’s voice makes all the difference here. Miku, being the piece of software she is, cannot express the beauty of the lyrics quite like Nagi. In “Kimi no Shiranai Monogatari,” Nagi conveys unto us the clumsiness that she feels upon realizing her feelings for another person amidst the beautiful, starry backdrop of the night sky! And as she gazes out into the vastness of the galaxy, the energy from the instrumentals goes up a notch as to reflect her pounding heart resulting from looking at that wondrous sight while coming to terms with her feelings as she compares herself to the legend of Orihime and Hikoboshi (see Tanabata). Altogether, this song is masterfully done. The piano part during the bridge is reminiscent of the energy in Nodame Cantabile’s “Allegro Cantabile,” and Nagi’s quiet voice builds up nicely to a rousing finish, filled with a touch of nostalgia that, when tied in with Bakemonogatari’s last TV episode, makes this song all the sweeter and more satisfying. With “Kimi no Shiranai Monogatari” bringing such a strong impression, it’s a shame that “LOVE & ROLL” doesn’t quite match it in terms of addictiveness. Nagi’s voice does shine once more, but this time, the mixing of soothing vocals amidst a vague feeling of anxiety is marred by the noticeable repetition. That is, all pop songs are going to have it, but here, the melody isn’t catchy enough that would really hold one’s attention and so, ends up dragging on. Other faults abound, ranging from the use of engrish that I find to be distracting, the whispered parts which feel more of a gimmick, and the abrupt way in which this song closes out. The funky rhythms and instrumentals are nice, but the way “LOVE & ROLL” is presented just does not cater to my tastes. But the single picks right back up with the “theme of ‘CENCOROLL'” which puts its electronica to good use to create a purely instrumental, but engaging track that has a short snippet that sounds almost like a Touhou theme. The beats are pretty nifty and I just wish the song was developed further. Still, I do like what I hear from this track. I’ll admit a healthy dose of context bias that comes with “Kimi no Shiranai Monogatari,” especially with how it all comes together in Bakemonogatari’s last TV episode. But even if you have no knowledge of that, it’s hard not to be taken by Nagi’s vocals, which fit in with supercell/Ryo’s compositions extremely well. Though “LOVE & ROLL” doesn’t make for as strong a followup, it doesn’t diminish what the previous track was able to imprint in the minds of its listeners and looking back at all the OPs and EDs to come out of 2009, “Kimi no Shiranai Monogatari” still remains my favorite. Oh, I totally know how you feel. I fell in love with Kimi no Shiranai Monogatari, even if I didn’t really watch Bakemonogatari.There’s something about good, clean vocals with piano (!) and a catchy chorus that I can’t get enough of! Don’t worry. Your biased view doesn’t separate you from the norm. I heard Kimi no Shiranai Monogatari and loved it, checking out Bakemonogatari shortly after. I find some Japanese singers have a tendency of sounding like a bleating sheep when they attempt fast vibrado. It happens in mostly the females, but isn’t restricted to them, either. For example, YUI is a popular singer, but I swear she turns into a sheep when she hits those high notes. Nagi’s voice strays close to, but not quite reaching, this quality, which gives it its charm, I guess. I find myself appreciating voices like Nagi’s. Professional Western singers are more often gifted with “better” voices in that they can sing more strongly, with bigger vibrado and fuller tone. But it is exactly that which turned me off of most Western music. It just sounded so professional and overblown that it was hard to relate to, whereas the more average voices of Asian singers don’t overwhelm me. thought there new single sounds similar to this one. Agreed on everything except that I find LOVE & ROLL quite charming 😛 The piano introduction is really beautiful of Kimi no Shiranai Monogatari. About supercell feat. Hatsune Miku I do like Black Rock Shooter to a certaine xtent (Like you) but to me the best song is ‘Melt’ or ‘World is mine’. Both are quite catchy and I believe ‘Melt’ was the one that skyrocketed Miku’s songs along supercell’s. Ahh I wanted to suggest you for the next review Kobato’s OSTs. They are quite good, one of the best OST of this last seasons. I always lurked around here but never commented until now, even though I always wanted to see you review Kobato’s songs. Tracks from this I found to be really excellent. For weeks Love & Roll and Kimi no Shiranai Monogatari were on the playlist for when I’m driving. Indeed! Good, catchy piano music backed by strong vocals are a clear winner pretty much every time. Haha, well, I have issues with YUI beyond just her high notes, but that’s for another time I guess. I’d also have to give Nagi’s voice the edge in terms of expressiveness. Maybe that’s why Asian singers might work better in certain contexts, namely, when it comes to trying to sound like genuine singers. It’s certainly at odds with the realities of the Japanese music industry if you’ve ever read articles at how such artist/production companies relationships are arranged though. It’s tough to beat, which is saying something since 2009 had quite a few memorable themes in addition to this one. Always glad to hear from those who love listening to this kind of stuff and from those who pay attention to the Vocaloid scene! As for Kobato, I’ll give it my due. I’m not as familiar with S.E.N.S. Project as I would like to be, but I do know that the music they made for Genji Monogatari have been enjoyable, especially for those who like their music soft and gentle. So yeah, I’ll be sure to give that one a go! If you enjoyed Kimi no Shiranai Monogatari, I recommend you check out the Nagi versions of Hajimete no Koi ga Owaru Toki (When the First Love Ends) and Melt. The former one in particular conveys the same sort of theme through its lyrics. Thanks for the pointers! Checked out her version of “Melt” and yeah, it’s definitely got that similarity to Kimo no Shiranai Monogatari and all I can say is that those high notes are damned hard to hit, aren’t they? Still enjoyable all the same. 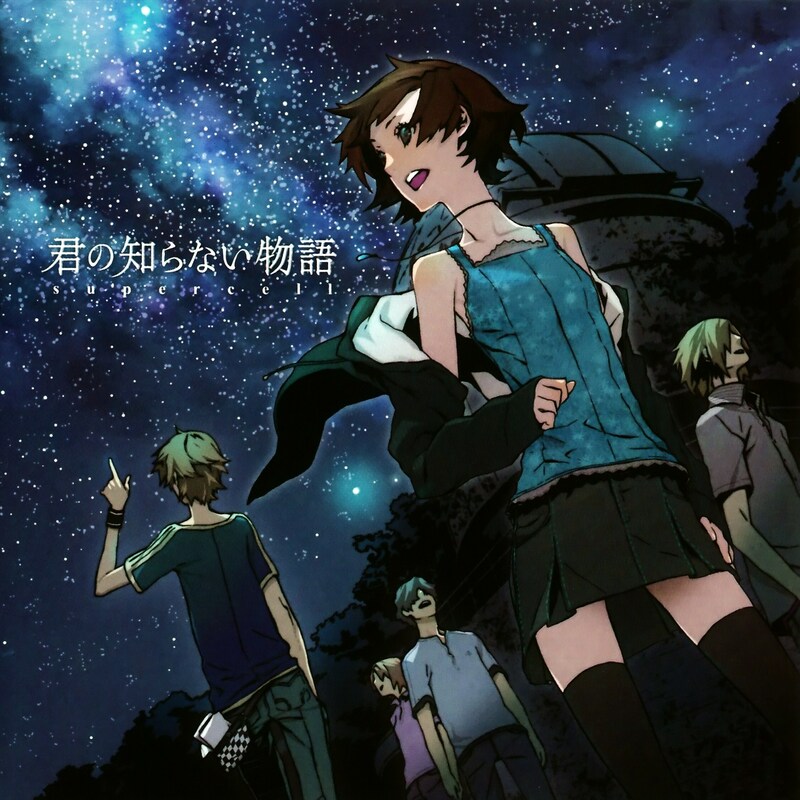 As for “Hajimete no Koi ga Owaru Toki,” I really love its pacing and it’s not as same-y as “Sayonara memories” is. That track is utterly brilliant! I enjoy listening to it! Hey, thanks for dropping by! Glad to see someone like yourself enjoying this flavor of music as well! I’m a huge fan of Nagi’s voice, and since I love Hajimete no Koi ga Owaru Toki I’ve been craving to hear her version of it, but I can’t find it anywhere. Would you mind showing me? As much as I like Nagi’s voice, I haven’t really followed up on much aside from what people have shown me or through that other Supercell album. Do let me know if you find it though!